We sell and support a wide variety of POS and computer hardware. We can also set up the hardware so you don’t have to. POS equipment can have many unfamiliar configuration options. For example labels printers can be direct thermal or thermal transfer. Or does your credit card reader need track 1, track 2, track 3 or some combination. 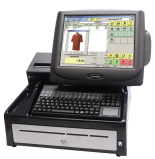 When you buy a POS system from us, all hardware purchased comes pre-configured. POS system can be individual components, platforms (separate components on a platform) or all in one (Computer, monitor, credit card reading in one). These are special built systems designed for 24/7 operation. 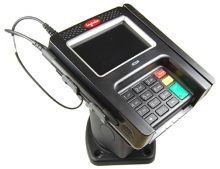 They also come with the additional ports required with many POS devices. Powered USB ports, Serial ports (optionally powered), Parallel port, and standard PS/2 keyboard and mouse ports. Barcode printers: These enable you to print labels on demand. From one to thousands. Labels are available in many styles: Small squares, rectangles or butterfly. Available in Direct thermal DT (no-ribbon required), Thermal transfer TT (uses ribbon, labels are better able to last in direct sunlight), and combination models able to use DT or TT labels. They can be purchased with serial, parallel, or network interfaces. 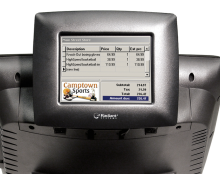 Touchscreens: Touchcreens allow fast data entry in many POS applications. There are many configurations available depending on the environment. 4-Wire resistive, Accutouch 5-wire resistive, IntelliTouch Surface Wave Technology, SecureTouch chemical and heat resistant, and CarrollTouch infrared technology for harsh environments. More.. Programmable keyboards: These combine standard keyboard functions with special programmable keys (one key press can send a series of key strokes to perform many functions). They also can have built in mouse pad and credit card reader. Customer displays: These come in several styles. Poll style, countertop, or mounted on back of the POS monitor or system. These enable the customer to verify items and pricing. They also can show total sale and change due as well as store messages. Card Readers: There’s more to them than you may think. Mag stripe readers to read traditional credit cards. Optical to read barcodes (badges), or smart card readers to read the new smart cards. Card readers can be used to read credit cards, employ badges as well as gift cards. Receipt printers: Available in thermal, impact and inkjet technologies. Receipt printers are available with check endorsement and slip printer capabilities and well as built in MICR (check reader) functionality. Payment Terminals: All-In-One easy to use touch screen customer display. Able to accept current magnetic swipe credit cards, smart cards (chip in card), contactless cards and smart phones. Also has Pin Pad for debit cards and display to show purchases and amount due.Ability to support End to End encryption. Customer Display. CounterPoint SQL can display enhanced sale information to the customer when a second monitor is connected. In addition ads can be run on this display. These ads can be your own or ads paid for by vendors or other merchants. 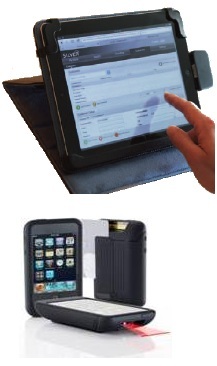 Data colectors, are pocket-sized mobile computers used to collect data for inventory, order-picking, gift registries, retail line busting or shipping/receiving. They can be batch or realtime data collectors. In batch mode they capture data through keyboard or the built in barcode scanner. Then set in a cradle to have the data uploaded to the computer. In real-time mode it trasfers the data as it is entered or scanned. CPMobile is a suite of mobile solution applications offered by Radiant Systems on the Apple iPod Touch, iPhone, and iPad platforms, integrated to CounterPoint SQL. CPMobile Item & Customer Lookup offers on-the-spot viewing of customer, item pricing and inventory details, while CPMobile Point of Sale provides for remote/mobile point of sale checkout, and Inventory Management offers mobile physical count capabilities. With CPMobile you just don't have a cordless solution, You can take CPMobile anywhere you have access to Wi-Fi or your cell phone network. From sidewalk sales to salesman routes or even a 50 state national tour. This is true mobility. You supply your own iPhone, iPod Touch, or iPad. We can supply the credit card reader and barcode scanner. We can also supply wireless BlueTooth receipt printers.